Perfectly Good White Boy by Carrie Mesrobian. Carolrhoda Lab. 2014. Review copy from publisher. The Plot: Sean's starting his senior year at school not quite sure about, well, anything. He and his mom had to move out of their home into a crappy rental, so "home" isn't really home. His amazing summer girlfriend has left for college, breaking up with him first. He has a few good things in his life. Like his friendship with his coworker, Neecie. And he's figured out how an average student with no hopes for any type of scholarship can get out of town: join the Marines. Which no one expects, in part because Sean isn't telling anyway. A year in the life of an average, not so average teen boy. The Good: Sean, Sean, Sean. I just -- he's just such a teenage boy. And that's what is so terrific about him: he's no one special. And in being no one special, he's very special. Sean's family has fallen apart, including the move into the rental, and Sean does the best he can. He's neither super son nor super slacker. And then there is Neecie, and Sean's becoming friends with her, and maybe something more. And it's just another example of complex people, and Perfectly Good White Boy having even the secondary characters be whole people. One more thing: I also love Mesrobian's way with words. "It was like she'd never been caught at anything and didn't know how to be sneaky, almost." And it's clear that she's a good girl but who thinks she is being bad, and that he's gotten away with a thing or two, and it tells so much in so few words. Oh, I lied. One more one more. I also love how matter of fact Sean's choice of joining the Marines is. I'm not sure what other books takes the reader through all the steps that a high school senior takes in joining up, and does so in a non-judgmental way. Yes. A Favorite Book Read in 2014. Other reviews: Cite Something; Just a Couple More Pages; Bibliodaze. Perfect timing - I just finished this last night, and I also really, really liked it. Recently someone on Twitter or somewhere was bemoaning the lack of average boys in YA lit, that they're all hackers, secret superheroes, ninjas, and the like. 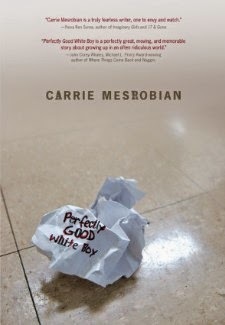 I think both of Carrie Mesrobian's books have outstanding "average" boys. Don Calame, too, although with a completely different sensibility. I think I was a little less charitable towards Hallie than you were, though. I'm pretty sure the title of the book comes from Better off Dead, where Lane falls into a garbage truck and two workers see him and say something to the effect of "What a shame that someone threw out a perfectly good white boy." I saw Hallie as using Sean and throwing him out. I didn't think she was evil or anything, just self-centered. I was definitely rooting for him to connect with Neecie. Sounds intriguing. I know a boy who left college to join the army but that was a worse fit. It's good to see this subject covered in YA. Happy new year! Howdy, Teen Librarian Toolbox Readers!